LISTEN NOW! Greg, Pat, and John discusses Reverend Billy Graham’s November evangelistic crusade My Hope, America. They further discuss during a Fox interview with Billy Graham where he was asked if he would do anything differently if he had the choice to do it over. Reverend Billy Graham said he would study more, pray more, and take less speaking engagements. He said he would also spend more time in meditations and telling Jesus how much he loved Him. They continue to discuss Billy Graham’s last crusade “My Hope America” in the month of November. The crusade is geared to lead people to the Lord where the Cross of Christ will be emphasized, as well as defining moments, and lose to gain. 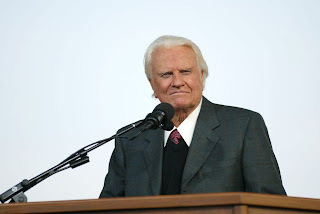 They also express their appreciation for Billy Graham’s faithful ministry and the prophetic word delivered by prophet Kim Clement which stated that upon the death of two men of God Oral Roberts, and Billy Graham, a tidal wave will begin that would usher in a great period of souls coming to the saving knowledge of Jesus Christ. Greg and John both share visions they have received regarding tidal waves the Lord showed them that will cause great devastation and loss of life. It will be some the best and worst of times. Many will come to the Lord as a result. It’s time to realize we are the next generation that is going to share Jesus with the entire world in all areas of life and society.